Here's an undergarment that offers both lift and Turtle Power. These masked cartoon peepers are ready to stare out from under your less turtle-filled clothes. 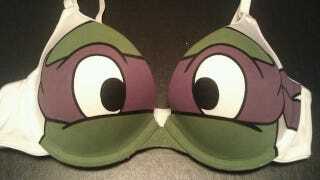 Etsy seller SceeneShoes sells these hand-painted Ninja Turtle bras. And if you prefer your underthings with fewer eyeballs, these geeky bras come in everything from Star Trek to Wonder Woman to Portal. I can't decide if wearing intimates in the form of Leonardo or Donatello would infuse me with the confidence of a mutant ninja, or just make me constantly crave pizza.